Local artists Katie Kozak and Lucien Durey presented What You May Call, an exhibition chronicling their ongoing residency in "Baba's House". The exhibition ran throughout June. Visit the Baba's House Tumbler or www.babashouse.ca and see the poster below. KC Adams: Hybridity of Nature and Technology This photographic exhibit was installed at NorVA for the month of September. KC Adams visited Flin Flon during Culture Days, and discussed her controversial and thought-provoking work with the community. Pauline's show features bright and rich colour layering. Her work is multi media, using photo emulsion transfers, printing, collage and numerous interesting combinations. Her work will be on display for the entire month of October. 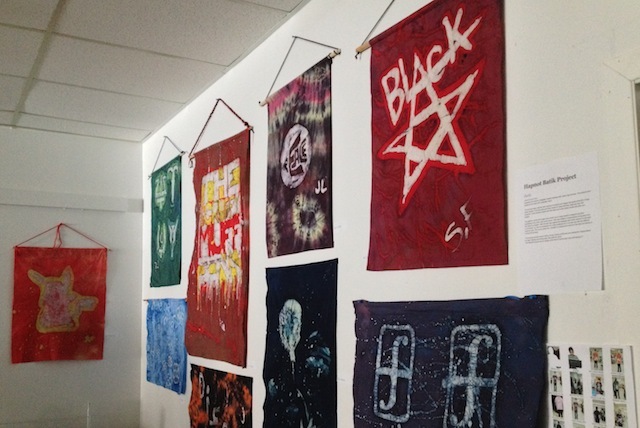 This exhibit of student batiks was on display until Feb 17th. Hapnot students created these dynamic hangings with cotton, dye and wax and used traditional dye baths with a beeswax resist. The process began with the class looking at symbols and images that spoke of the 60’s Flower Power decade. 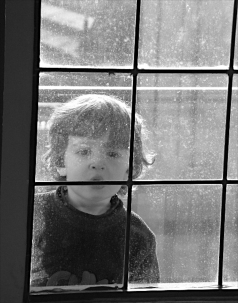 From that starting point they looked for ideas that they might use for inspiration. Some students stayed with their initial inspiration and others moved on to their own imagery. The patterns, words and images were drawn out on large sheets of newsprint and then transferred to cotton with conte crayon. Wax was then heated in reused electric frying pans from the Home Ec program. After the wax was applied the hangings were either placed in a dye bath or scrunched up, tied and squeezed into small containers for a crumple dye with two different coloured dyes. The young artists then made the decision to continue with a second dye bath and waxing or to finish the process. Finishing the process involved rinsing, drying, ironing out the wax and sewing the hanging sleeve by hand. Sewing and ironing were new skills for some! This exhibit, a series of black and white portraits from Ecuador, China, Canada and Argentina, offers a fascinating study of the human experience. After 4 weekends of batik intensive, some of the almost-finished pieces from the workshop are on display. The workshop was led by Sarah Trevor and Karen Clark. These are paintings by artists who participated in the NorVA "Plein Air" Workshop with Cam Forbes on May 10 & 11. See photos from this workshop here! 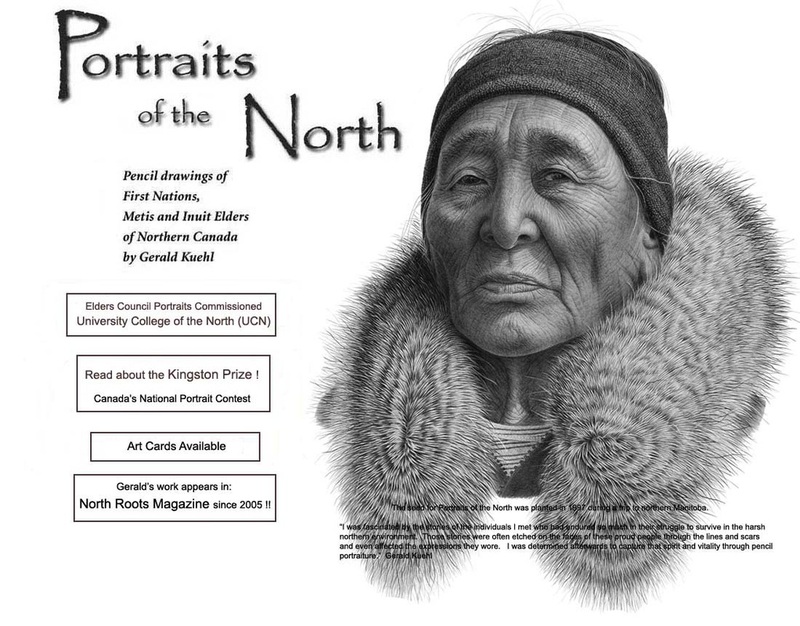 Gerald Kuehl's Portraits of the North show, an impressive collection of detailed pencil drawings of First Nations, Metis and Inuit Elders of Northern Canada was on display at NorVA for the month of September. Read about Kuehl's visit to Flin Flon on our blog. 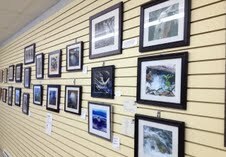 October 2012 STAMPWorks, a travelling exhibit featuring miniature works by artists from all over Manitoba including NorVA artists Linda Mandes, Karen Clark, Norine Simes-Carriere and Betty Fitzsimons. Stacey Becker, a local teacher, and Trent Tuttosi, a former Hapnot teacher, travel to Guatamala each year and bring back items to sell at NorVA. 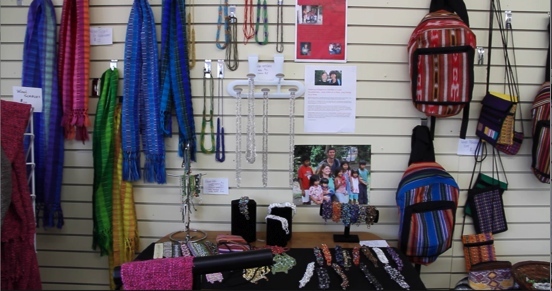 You're sure to find a beautiful gift in this collection, which includes silver and beaded jewellery, intricate scarves, purses and toques for the cold weather.